The Fish Fry is coming up on Thursday, March 21st! 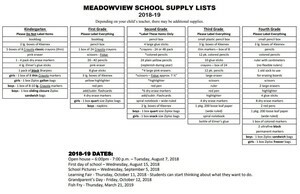 Please review the 2018-19 Supplies List for Meadowview Elementary School. Your student is welcome to bring their supplies on the "Back to School Night" or the first day of school.